We have our first entry in the Three Hour Paper Mache Challenge today. Now, here’s Carol, and her three-hour project. Enjoy! Hi everybody, It’s me “Tiki” Carol hailing out of Sunny Florida where my husband and myself are enjoying an early retirement. I have over 20 years experience doing craft shows through the 1980’s and 90’s, mostly in shopping malls. For you youngsters who may not know; there used to be troupes of 40+ traveling artisans that would seemingly invade your local shopping mall for a 5 day show. Sadly with the advent of retail kiosks, show such as these have gone the way of the dinosaur. I am proud to say I was part of that craziness back in the day. My medium at that time was wood names. Now many years latter I have had to find a more economical way to craft. Paper mache fits the bill. I also freelance draw and paint. Quickie cool summer project with very little investment (if any). pencil, scissors, roll of toilet tissue (cheep roll with no oily additives works best), empty T.P. 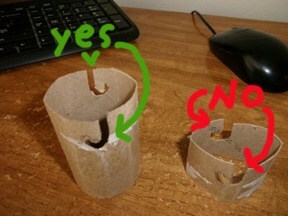 Roll, and your favorite paper mache medium (I use white glue/water 1:1 mix). A blunt brush (old paint brush) is optional. Pic 2: Fold T.P. Roll length wise. Pic 3: Turn quarter turn and fold again then lay flat. Pic 4: Draw a wild face. Exercise your imagination, or you can always do an internet search on Tiki’s for inspiration. Make sure that each half of the face straddles fold. Pic 5: Refold roll on the straddle line mentioned in step 4 (pic 4). Pic 6,7,8 and 9: Cut out areas you’d like light to show through. You can use an exacto knife for this, but scissors are more friendly with me. Pic 10: Coat with paper mache medium. Pic 11: Lay a sheet of your T.P. on wet surface. You may have to dab in with a blunt brush. Pic 12: We are 45 minutes in on these 3 pictured with 1 layer of T.P. Note the holes visible where paper has ripped. Don’t fret if this happens. They will be covered with additional layers after previous coat dries. Pic 13: Pictured are Tiki’s after 3 coats of T.P. We are now ready to close in the top. Coat top edge with layer of paper mache medium. Pic 14: lay a sheet of T.P on top. Pic 15: drip some medium onto tissue as pictured. WARNING! DO NOT TRY TO BRUSH IT ON. Pic 16 and 17: Fold one corner onto center of tissue, continuing around until all 4 corners are onto center. This is like giving a second layer of tissue. Pic 18: Repeat step 16 folding the corners again. You can tuck in any wayward edges. We’re now an additional half hour into the project. Let everything dry. Your Tiki’s can now be used for ‘mood’ lighting by placing over a BATTERY OPERATED tea lamp. The Light will show through the thin toilet tissue layers. Pic 19: Coat with brown acrylic thinned to a stain. Pic 20: Shows how holding Tiki under a light will show where to paint a more solid color. Pic 21: The 3 Tiki’s with a white dry brushed over opaque acrylic. Thanks, Carol. This looks like a fun summer project. Now I just have to get my chicken clock finished – it’s already painted, and just waiting for the varnish to dry. Maybe that post will go up after the holiday. If anyone else has a fast, easy paper mache project you’d like to show off, please enter our Three-Hour Paper Mache Challenge. I am in the process of making one of these tiki’s as an example for my elementary students to use as a guide. What is “a white dry brushed over opaque acrylic” in Pic 21? Thanks! Hi Kristi. I don’t know if Carol is still watching for comments on her guest post, but I might be able to help. I believe she means to paint your color on first, so it covers the paper, and then go back over it with white acrylic paint. This time, use a dry-brush technique, taking a very small amount of the white paint onto you brush and lightly moving the brush over the colored area, so most of the color still shows through. I hope this helps. And I hope you students have fun making this project, too. Oh thanks so much for responding!!! I wondered if anyone would respond since the last post was several years ago. I also put a little twist on the project and used colored tissue paper like the kind you would use for gifts instead of toilet paper. This kind of gave it a little color before painting. I plan to paint the white as the next step. Thanks again!!! That sounds really nice. I hope you’ll post a photo on the Daily Sculptors page when it’s done. We’d all love to see how it comes out. I hope everyone is enjoying my “How-To” and having a safe holiday. Just wanted to give a extra tip I failed to mention in the tutorial. Save those tubes from wax paper, cling wrap and foil. They can be cut down to length, or you could even try a Totem Pole if you feel adventurous. Hey Jonni, I’ve been following your blog for a while now and I was thinking about buying two of your books. Just had a quick question though: do your books instruct the reader how to paint the animals? Thanks Ramona. They are a lot of fun to make. Carol, can we put the tikis over led Christmas lights? It would be fun to have them circling a deck for a party. Yes Jonni, as long as light source emits little or no heat. I did an impromptu test as pictured. A “J” slot on each side of tube top in lieu of whats show in pictures 13 thru 19; leaving both ends open would work. BUT the slots would have to be opposite each other (in alignment) as show on the left tube. This would enable the tube to hang straight.